LISTEN TO THE EPISODE ONLINE HERE, OR BETTER YET SUBSCRIBE TO THE PODCAST ON iTUNES HERE. 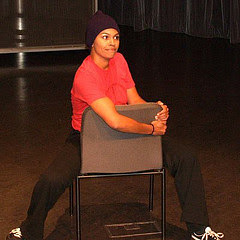 This week's podcast is a chat with Maya Lilly (link to her website), who wrote and performs the one-woman show "Mixed," about people of mixed race, or multiracial people. Be sure to check out the show if Maya is performing near you! Maya wasn't hearing or seeing the stories of multiracial people, so she decided to tell some herself. She conducted hundreds of interviews with people of mixed race, which she then used as the basis for the composite characters in "Mixed," which she performs at theatres, college campuses, community centers and other places nationwide. One of her ambitions is to perform the show at the White House, for a certain occupant who has a black father and a white mother. I think that's totally rad, and I hope she gets to do it. I'd also like to thank Mahayana Landowne, the show's director, who I also talked with but didn't get a chance to include in this podcast episode. A theme that emerged in talking with Maya was that of "character." How did she develop the composite characters for the show? What "roles" are multiracial people expected to play in everyday life? And how does any of us of whatever racial background come to think of our own or others' characters? Thanks for listening!